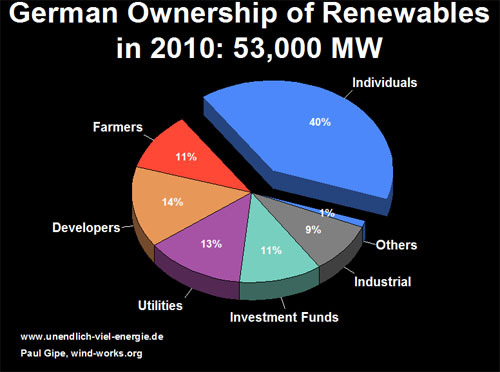 Germany, a country where 51% of the renewable energy generation is owned by its own citizens, will be hosting an international conference on community power 3-5 July, 2012 in Bonn, the former capital. The conference will be held in the historic chamber where the world’s first feed-in law was enacted, the former home of the Bundestag, Germany’s parliament. The Stromeinspeisungsgesetz, literally the “law on feeding in electricity” (to the grid) was introduced by conservative Bavarian farmers frustrated with their utility’s intransigence to connecting their small hydro plants with the grid. The “feed-in” law was passed overwhelmingly by the conservative government of Helmut Kohl, and quickly ushered in a revolution in the way electricity was generated in Germany, spreading rapidly from Bavaria in the south all the way to the Danish border in the north. Farmers, individuals and community groups could, for the first time, emulate their Danish neighbors by installing their own wind turbines and selling the resulting electricity at a hoped-for profit. These electricity rebels, Stromrebellen as they’re called in German, began appearing all across the country, even in the former communist East Germany. The Bonn conference is timely. Interest in community ownership of renewable energy generation is increasing not only in Europe but also in North America, following the launch of Ontario’s groundbreaking feed-in tariff program of 2009. Ontario’s policy specifically encourages community and aboriginal ownership of renewables. Currently 800 MW of projects, a full 20% of all projects in the Ontario program, are under contract, though not yet built. Nevertheless, potential community ownership in Ontario and the existing 300 MW of community wind in Minnesota pale in comparison to community-owned renewables in Germany. 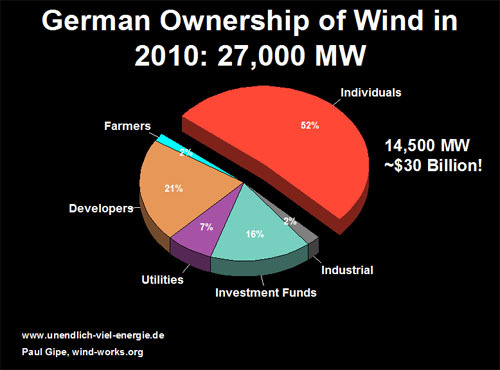 In 2010, 51% of the more than 50,000 MW of renewable energy capacity in Germany was owned by farmers or individual citizens. This represents a staggering $100 billion in private investment. German farmers alone have installed 1,600 MW of biogas plants and 3,600 MW of solar photovoltaics (solar PV). For comparison, in 2010 there was only 60 MW of biogas plants and 2,200 MW of solar PV in the entire USA. Citizen-ownership is a direct translation of the German term Bürgerbeteiligung. Though there is a long history of cooperative ownership in the English-speaking world, the concept of local ownership of energy generation is so novel today that the term “citizen” appears awkward on the tongue. Even in the land of Thomas Jefferson, the word “citizen” has fallen out of favor in preference to “individual”. It is ironic that it is non-native speakers of English who have begun to revive both the word “citizen” and its meaning. Travelers to Germany marvel at how “Jeffersonian” the Bürgerbeteiligung movement has become in democratizing electricity generation, by literally placing power generation in the hands of the people. German farmers, community leaders and entrepreneurs are not only democratizing electricity generation and renewable heat, but are also setting their sights on an equally ambitious prize, the transmission system itself. The conference is being organized by the World Wind Energy Association (WWEA) and the German Wind Turbine Owners Association (BWE). Both organizations are longtime supporters of community ownership of renewable energy. 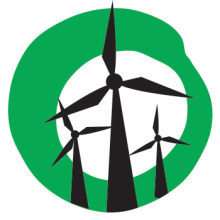 Because it represents the thousands of individual owners of wind turbines in Germany, BWE has become the world’s largest wind energy association. With backing by federal, state and local government, the community power conference is expected to attract attendees from around the globe. Gsänger recently won the International Community Power Award from the Ontario Sustainable Energy Association for his work fostering “citizen” ownership of renewable energy. Great post, Ben. It’s funny how a Canadian picks up information on an Australian blog that was written by an American about a German, Canadian and Minnesota phenomenon.